We think it's a match made in heaven: Metal pipe fittings and rough-hewn wood look spectacular together. 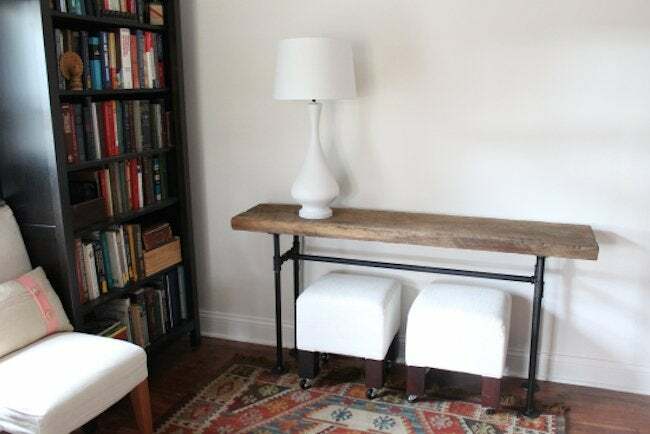 Here, handmaidtales combines the two in a compact console table that's not only eye-catching, but also remarkably easy to make. One of the great perks of building your own furniture is that you can customize it to fit your needs. There are so many sizes and fittings of black pipe, you can basically create any shape you want. 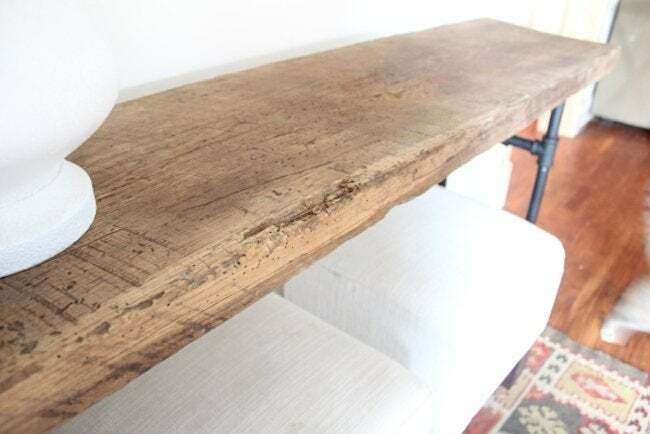 The barn wood we had was 62 inches long and about 14 inches wide and we bought pipe to fit it, but if you’re building your own, you may want to get different sizes based on the size wood you choose. Black pipe can be cut and threaded to any length you choose. We chose 3/4 diameter pipe because we liked how substantial it looks. Our material cost was about $125 (black pipe isn’t cheap!) but that’s still a whole lot less than some of the other console table options I liked and we were able to customize the length. I also wanted to be able to fit our ottomans underneath so we could have a bit of extra seating when we need it. Our process was pretty straight forward. 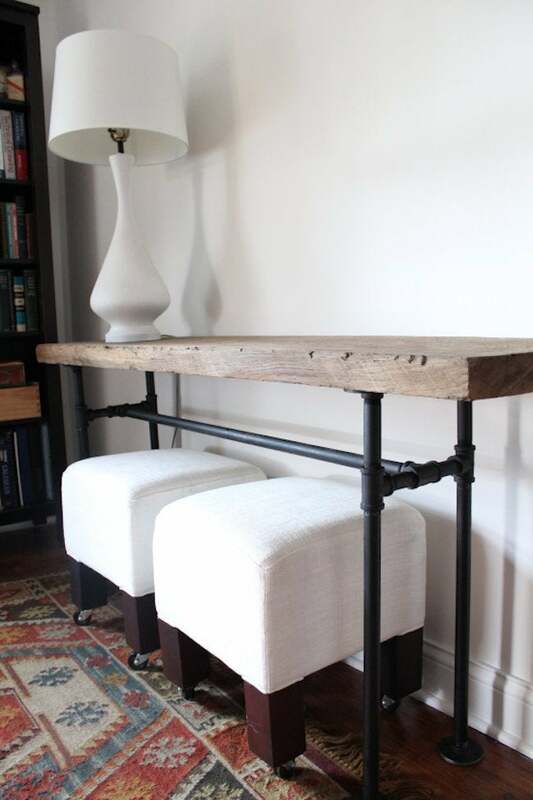 Once we decided on 3/4 diameter pipe, we just played with the fittings at Home Depot until we got the look and stability we needed to support our heavy wooden slab. 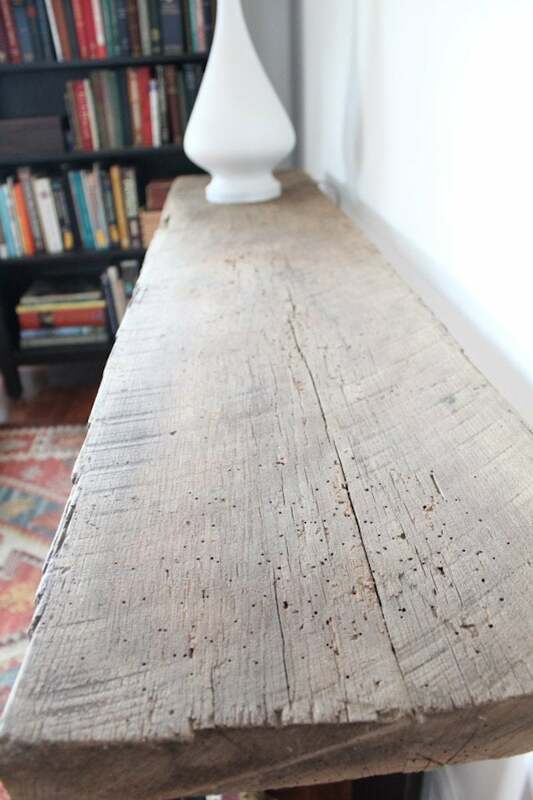 We initially thought we wanted a shelf too, but once we spied this huge slab in our pile of salvaged wood, we knew that keeping it simple was a better idea. It’s got so much character; saw marks, wormholes, etc. We didn’t do anything to it except give a wipe down and a quick coat of teak oil to even out the color and bring out a little bit of depth. I initially thought we would cut down the board to be closer to 52 inches, but once we had everything put together, we decided to leave the edges as is. Once the base was assembled, I took it out to the backyard and seriously cleaned it. Black pipe always has a ton of cutting oil residue, so before I painted it I gave it a really thorough cleaning with a degreaser. I used Rust-Oleum High Performance Enamel spray paint in flat black. I only had to do one coat to even out the color over the whole base. Once it was dry we simply screwed it on out board upside down and voila! 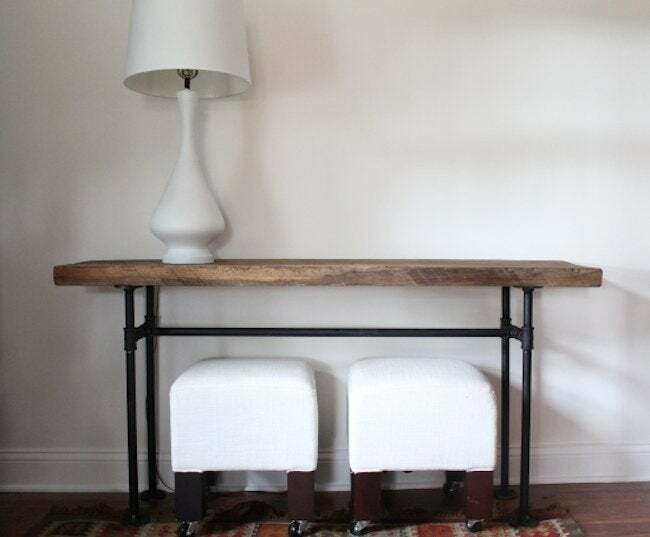 Gorgeous, rustic/industrial table.